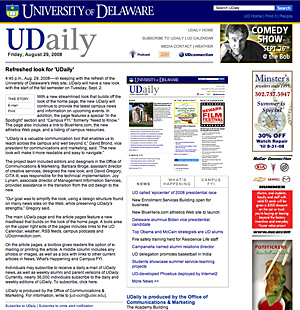 4:45 p.m., Aug. 29, 2008----In keeping with the refresh of the University of Delaware's Web site, UDaily will have a new look with the start of the fall semester on Tuesday, Sept. 2. With a new streamlined look that builds off the look of the home page, the new UDaily will continue to provide the latest campus news and information on upcoming events. 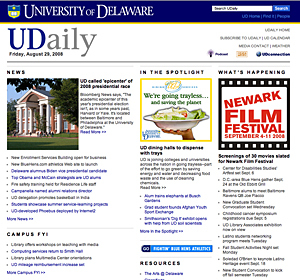 In addition, the page features a special “In the Spotlight” section and “Campus FYI,” formerly “Need to Know.” The page also includes a link to BlueHens.com, the new athletics Web page, and a listing of campus resources. The project team included editors and designers in the Office of Communications & Marketing. Barbara Broge, assistant director of creative services, designed the new look, and David Gregory, CITA III, was responsible for the technical implementation. Joy Lynam, associate director of Management Information Services, provided assistance in the transition from the old design to the new. “Our goal was to simplify the look, using a design structure found on many news sites on the Web, while preserving UDaily's strengths,” Gregory said. The main UDaily page and the article pages feature a new masthead that builds on the look of the home page. A tools area on the upper right side of the pages includes links to the UD Calendar, weather, RSS feeds, campus podcasts and UDconnection.com. On the article pages, a toolbox gives readers the option of e-mailing or printing the article. A middle column includes any photos or images, as well as a box with links to other current articles in News, What's Happening and Campus FYI. Individuals may subscribe to receive a daily e-mail of UDaily news, as well as weekly alumni and parent versions of UDaily. Currently, nearly 36,000 individuals subscribe to the daily and weekly editions of UDaily. To subscribe, click here. UDaily is produced by the Office of Communications & Marketing. For information, write to [ud-ocm@udel.edu].